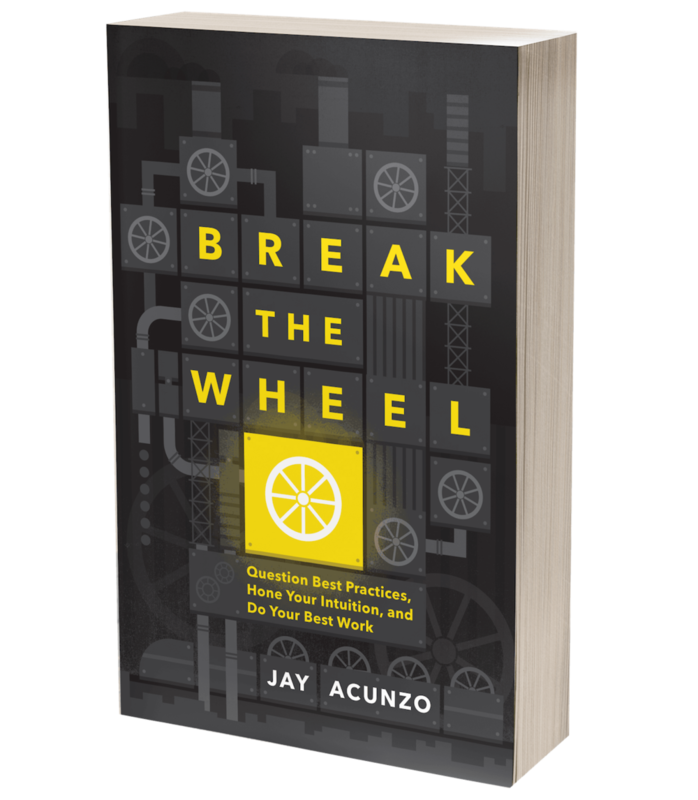 It's All About Attention: Why Trusting Your Intuition Matters in a Noisy World — Jay Acunzo | Author. Speaker. Maker of Shows About Work. We live in the noisiest era in history -- a time when consumers (that's all of us) have won the war for our own attention. We have so much choice facing us in every imaginable form, medium, screen, etc., that we have all the power over media and marketers, because if we don't like something, we can easily find a replacement. In fact, with every second that passes, that amount of choice increases to the tune of 17 new web pages per second. So anyone hoping to reach us -- to reach the consumer -- must first start by becoming the object of our CHOOSING. The name of the game today is attention. Can you acquire it? Can you retain it? Can you convert it? You need to question conventional thinking and trust your own intuition. Conventional thinking doesn't stand out or gain attention. It's stuck in the past. It's done well, but it was created years ago. And following someone else's thinking (usually in the form of a list article you found and followed) only creates sameness, not the originality needed to stand out. So what's this "intuition" stuff? Isn't that a bunch of malarky (to quote the great Joe Biden)? Not so fast, because it very well might be the key to gaining attention and producing anything differentiated enough to get results. Albert Einstein -- not one often associated with fluffy nonsense -- called intuition our most valuable, most underused ability. To him, it was "a feeling for the order lying behind the appearance of something." Research psychologist Gary Klein, who spends his life studying human decision-making, calls intuition "the pattern-matching process that quickly suggests feasible courses of action." But let's distill it for our world in business: Intuition is your ability to draw unique insights from a combination of your personal experiences. This is what enables that craft-driven creator on your team -- perhaps that's you -- to quickly and easily know that yet another How-To article might not succeed as much as that epic new idea she just pitched. But where did she come up with it? Intuition, not some kind of conventional approach or best practice. It's how brands like Marriott or Red Bull knew to build internal media production houses, despite the past playbook pointing to more banners or TV spots. It's how Finn Dowling at the Humane Society of Silicon Valley can write a single blog post about a dog, written on some lousy blogging tech with barely any time or money or readership ... and still reach 7 million people in a week. It's how every person in every story we tell on my podcast, Unthinkable, can stand out and gain attention in a noisy world. It's about trusting your intuition. As I head into Northeastern University this week to teach a couple classes, I find myself continually referencing this same series of facts: We live in the noisiest era ever; consumers have won the battle for their time; attention is the goal; and creative intuition is the means to that end. That is the backdrop for everything happening in media and marketing. Period. It's why content marketing matters and actually works. It's why Snapchat is currently thumping Twitter as a consumer app and network. It's why Uber's biggest opportunity aside from self-driving cars very well might be mid-ride experiences, like upselling related Uber products through the app or in-car ads -- they have our attention after all. Why am I so passionate about this? Because this means the time of the craft-driven creator is now. Optimization and incremental growth tactics are already becoming increasingly automated and commoditized across companies thanks to technology and the listification of every tactic. But makers who love to make, who know how to execute those original ideas, who empathize with an audience to reach them and resonate, and who can derive unique insights from past experiences through their finely honed intuition -- WE NEED MORE LIKE THEM. Except if I have anything to say about it, instead of "them", we'll be saying, "YOU." My mission with Unthinkable is simple, but hard: Help more people reject conventional thinking and trust their intuition. That is THE skill, THE path to success in a noisy world. It seems completely unthinkable to say or do, hence the name. What would possess Radiolab to make radio sound the way it does after years doing it one way? What would make Amazon CEO Jeff Bezos buy a traditional publisher like the Washington Post? How could Drift's CEO David Cancel tell his marketers to remove every lead-gen form on the website? It looks unthinkable. To them, however, it feels obvious. Why? And how do we make sure we're honing our intuition to better trust it too? So, if you want to become a true master of marketing, a maven of media, or another, more jargon-free title that makes me throw up in my mouth a little bit less ... maybe subscribe and listen to Unthinkable ;) But mostly, keep the examples and questions and ideas coming. Access stories, resources, and community to help you better trust your intuition: subscribe below! Reject convention. Trust your intuition. Get a short note each Monday AM with our weekly story, plus bonus content and creative experiments available only on the newsletter. Posted on October 16, 2016 by Jay Acunzo.